Labesse,, bill of exchange of, 353. Lacour's Plantation. See St. Christopher. Lady Park Wood, co. Cornwall, 128. Laghane, Ireland, lands called, rent charge payable out of, 62. Lagos, Portugal, Consul at, payment by, 158. Lake, Giles, et al., payment to, out of the residue of the appraisal of the Jolly, 144. -, Phillip, tidesman and boatman at Bideford, 412. -, Richard, master of the transport ship King David, 453. -, Thomas, letter to, concerning the Queen's share of money recovered from the Crown of Portugal, 387. Lamb, Isabel, pensioner on the Charity Roll of Scotland, 471. Lambart, Richard, 4th Earl of Cavan, petition for a pension on the Establishment of Ireland, 451. Lambert, David, an agent and trustee for the recovery of the debt due from the Crown of Portugal, 444. -, Michael, grant of a plantation in the French part of St. Christopher, 387, 491. Lieutenant Governor of St. Christopher, 387, 491.
services and losses of, in the French invasion, 387, 491. La Motte, Cornelius de, son of Daniel, pension for, 208. -, Daniel de, merchant of Rotterdam, services of, in discovering treacherous correspondence, 208. -, Paul Robert, captain in La Meloniere's regiment, the Woolpacks and La Bartt's regiment, pension and services of, 3034. Lampkin, James, waterman to the Prince of Denmark, 299. Lamplugh, Richard, sheriff of Cumberland, 418. Lancaster, county of, Auditor of Crown Land revenues, fee of, 109. Receiver General of assessments. See Thornton, J.
Lancaster, co. Lancaster, Assizes, 134.
port, Deputy Comptroller of, See Tomlinson, J.
Lancaster Herald. 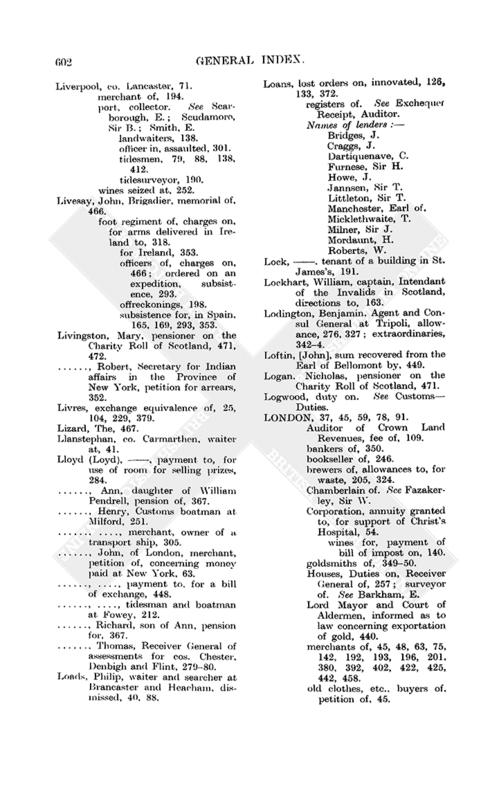 See King, G.
grants and leases of, 7, 41, 44, 62, 64, 68, 83, 90, 94, 97, 113, 128, 147, 170, 172, 183, 184, 1912, 194, 206, 209, 210, 240, 259, 277, 286, 291, 296, 302, 305, 316, 317, 359, 3735, 425, 431, 439, 445, 461, 466, 468.
fines of, moderation of, 68, 131. Parliamentary survey of, 317, 375, 466. Auditors, 210, 240, 374, 431.
fee farm rents, purchased, contract not perfected, Act 1 Anne, c. 1, and, 272.
defective, petition for other rents in lieu of, 301.
fallen short of sum contracted for, petition for reprisal, 210. Trustees for Sale of, 210. Receivers of, payment by, 438. Surveyor General of (S. Travers), 20.
deputy to. See Taylor, J.
letters to, 126, 165, 205, 421.
memoranda, ratals, reports, etc., of, 64, 69, 94, 1289, 183, 192, 194, 205, 240, 249, 257, 259, 273, 277, 291, 317, 347, 372, 374, 431, 466.
petitions, etc., referred to, 41, 44, 62, 65, 90, 104, 105, 109, 124, 127, 131, 170, 172, 184, 202, 206, 210, 302, 305, 318, 361, 373, 402, 439, 445, 468.
warrants to, 94, 128, 183, 257, 259, 277, 313, 316, 317, 372, 374, 466.
derelict, directions to Attorney General to stay proceedings on, 6, 103.
devised to the Crown, 458, 463.
extended for debts, 83, 147, 152, 237, 305, 349, 359, 422.
outlaws' lands, 83, 286, 296, 433, 461. See also Forfeited estates. Lane, Hen., lieutenant in Brigadier Tiffin's regiment, half pay for, 122. -, Ralph, sheriff for co. Cambridge and the Isle of Ely, payment by, 107. -, Thomas, pension of, payment on, 279. Lanesborough, Laneborough, [co. Longford], barracks in, maintenance of, 120. Langston,. colonel, payments to, for military expenses in Ireland, 479, 480. -, Francis, lieutenant general or major general, one of the General Officers of Ireland, 131.
purchasing horses in Ireland, 307.
regiment of horse of, detachments from, clothes, etc., of, 244, 425. Lany, William, clerk to the Attorney General, payment to, 54. La Piementi, Claude Renaut de, widow of. See Huguetan, Susanna. Laraiche, Larache, Alcaid of, presents to, 340, 341. Laresiers Plantation. See St. Christopher. Laroch (Laroche, Loroch), Peter, Page of the Backstairs and Barber to the Prince of Denmark, 221, 223, 298. Larosier's Plantation. See St. Christopher. Laspoy,, captain, widow of, petition for pension in Ireland, 413. Lasseur, , bill of exchange of, 353. Lau, Mary, pension in Scotland for, 473. Lauder, . lieutenant, wounded, royal bounty for, 354. 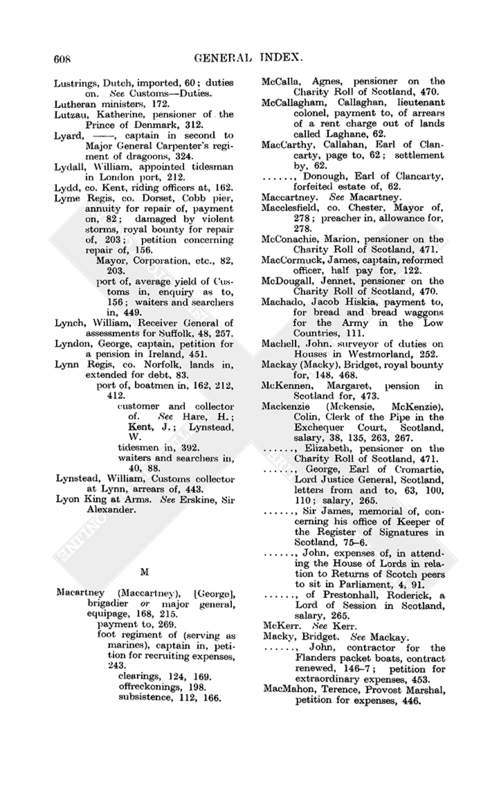 -, of Fountain-hall, Sir John, a Lord of Session in Scotland, salary, 264. Lauderdale, Earl of. See Maitland, J. Laundry Warren. See Bagshot Park. Law, John, minister of the Gospel, Queen's Almoner in Scotland (Queen's Almoner at Edinburgh), allowance to, for alms and salary, 59, 263, 266. Law charges. See Crown Law charges. Lawrence, Wigfall, burglar, reward for arrest of, 292. Laws, John, H.M. Secretary at Brussels, ordinary of, 51, 328.
imprisoned for debt, petition, 368. -, Joseph, a Serjeant at Arms, fee, etc., 224. Laycock, Richard, commander of the Dover packet boat, petition, 446. Layng, John, Gentleman Usher to the Prince of Denmark, 222, 298. Leach, William, tidesman in London port, 40. Leagues and Treaties (The Fdera), payments for transcribing, printing, etc., the 9th and 10th volumes, 133, 376. Leak (Leake), Sir John, Admiral, advice sent to, of convoy to Gibraltar, 158.
fleet commanded by, contingencies of, 215.
salary as a Commissioner of the Admiralty, 462. Leavesly, Robert, appointed tidesman at Bristol, 162. Leeds, Duke of. See Osborne, Thomas. Leenders, Birch, captain, payment to, for freight of King of Spain's coaches, etc., 160. Leeward Islands, Captain General and Governor (Commander) in Chief of. See Parke, D.
dearness of provisions in, 430. Deputy Auditor for. See Kerby, T.
Four and a Half per cent. Duty in, collector of, 430.
salaries and incidents, method of payment of, 430.
sale of goods, directions concerning, 429, 430.
invasion of, by the French, 387. Secretary to the Extraordinary Embassy to the King of Portugal, ordinary of, 328. Legge (Legg), William, Lord Dartmouth, a Commissioner for Trade, salary, 68, 279. -, William, tidesman in London port, 79. Leghorn, 67, 335, 336, 343. Prizes Agent at. See Crow, C.
Leicester, county of, Auditor of Crown Land Revenues, fee of, 109. Receiver General of assessments. See Bradgate, J.
Leicester, Earl of. See Sydney, John. 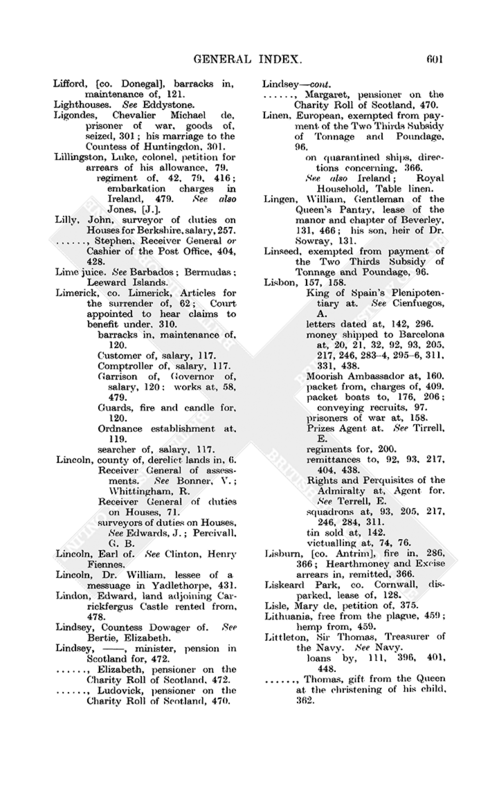 Leieth, George, appointed tidesman at Workington and Flimby, 138. Leigh, Giles, site of manor of Walton Leigh bought from, 374. -, John, Salt Duties officer at Middlewich, recommended to be a supervisor, 465. Leinster, Province of, barracks in, maintenance of, 120. Leitch, Jennet, pensioner on the Charity Roll of Scotland, 470. Leith, 75, 142, 171, 247, 420.
port, Customs officers in, certificate of, 142. Customs salary bill, 42, 134, 258, 388, 482.
foreign salt purchased in, 365. General Inspector and Adjuster of damaged tobacco and wines, appointment, 59. General Visitor in, proposal for a, 250.
the first port in North Britain, 421.
senior Deputy Chamberlain in the Exchequer Court, 83, 233, 291, 384, 474. Lennox, Charles, Duke of Richmond, memorial of, for grant of Richmond House or ground in Whitehall, 439. Lenton, John, Groom of the Vestry, payment to, 24, 235. Lepell, Nicholas, colonel, foot regiment of, at Chester, 87. Lesley (Lesly, Lessley), Alexander, First Underkeeper of the Wardrobe in Scotland, salary 267. -, Jean, pensioner on the Charity Roll of Scotland, 472. -, Pa., a Justice of Peace in Shetland, 195. Lesser, John George, pensioner of the Prince of Denmark, 312. Leuwen, Peter Hopesteyn van, of Delft, father of Sybilla, 96. -, Sybilla Hopesteyn van. annuity on the life of, 96. Leven, Earl of. See Melville, David. Leverstock, Charles, waiter and searcher at Axmouth, 449. 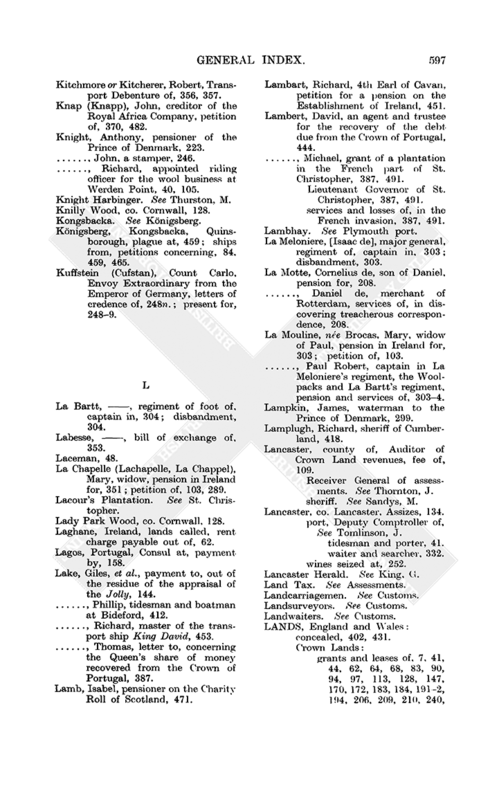 Levinge, Sir Richard, Solicitor General, Ireland, payment to, 57. Levingston, James, Earl of Newburgh, grantee of the Rangership, etc., of Bagshot Park, 150. -, Robert, Army debenture of, 357. -, William, petition of, concerning seizure of wines, 247. Levovish, Lord Alexander, relative of the Czar of Muscovy, entertained at the Queen's charge, goods of, 44. Lewis, Lewes, Scotland, foreign salt purchased in, 365. Lewis, Roger, chaplain for Virginia, passage money for, 139. Ley, Margaret, Countess Dowager of Marlborough, royal bounty for, 376, 468. Leybourn, Stafford, lieutenant, reformed officer, half pay for, 122. Leyden, Holland, postmaster of, payments to, 338. Leyoncrona (Leyoncrone), , Envoy Extraordinary from the King of Sweden, letter from, concerning ships in quarantine, 401, 416. Leys. See Burnett, Sir T.
Lichfield Cathedral, Dean and Chapter of, perpetuity of, payments on, 53, 464. Vicars Choral of, perpetuity of, payments on, 53, 464. Liddell, Agnes, pensioner on the Charity Roll of Scotland, 470. Lifford, [co. Donegal], barracks in, maintenance of, 121.
his marriage to the Countess of Huntingdon, 301. 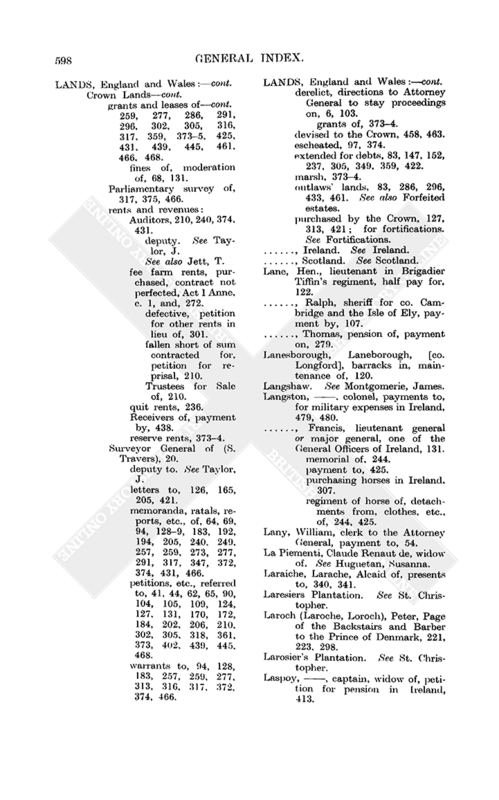 Lillingston, Luke, colonel, petition for arrears of his allowance, 79.
embarkation charges in Ireland, 479. See also Jones, [J.]. 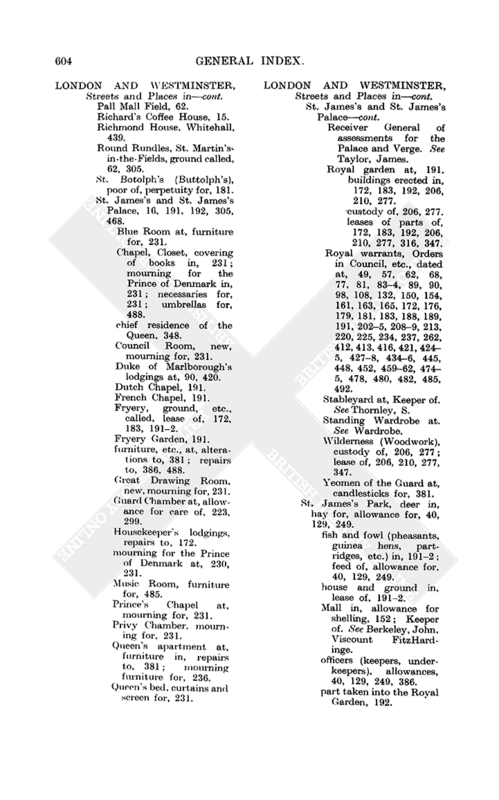 Lilly, John, surveyor of duties on Houses for Berkshire, salary, 257. -, Stephen, Receiver General or Cashier of the Post Office, 404, 428. Court appointed to hear claims to benefit under, 310.
barracks in, maintenance of, 120. Guards, fire and candle for, 120. Lincoln, county of, derelict lands in, 6. Lincoln, Earl of. See Clinton, Henry Fiennes. Lincoln, Dr. William, lessee of a messuage in Yadlethorpe, 431. Lindon, Edward, land adjoining Carrickfergus Castle rented from, 478. Lindsey, Countess Dowager of. See Bertie, Elizabeth. Lindsey, , minister, pension in Scotland for, 472. -, Ludovick, pensioner on the Charity Roll of Scotland, 470. -, Margaret, pensioner on the Charity Roll of Scotland, 470. 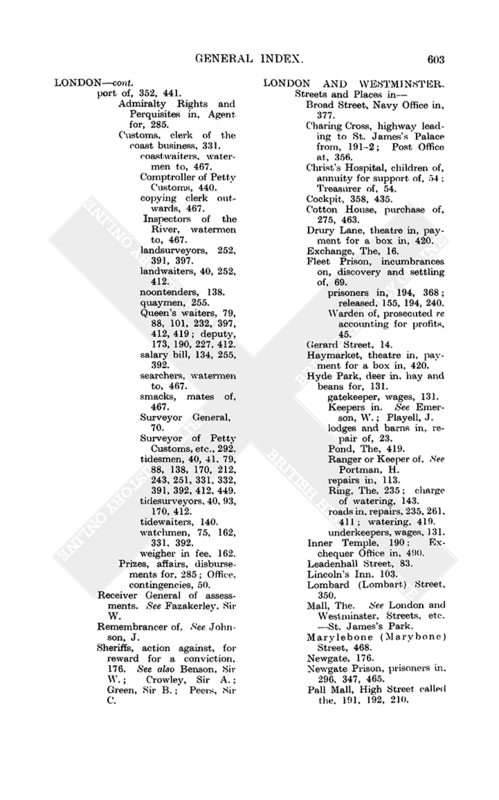 Linen, European, exempted from payment of the Two Thirds Subsidy of Tonnage and Poundage, 96.
on quarantined ships, directions concerning, 366.
his son, heir of Dr. Sowray, 131. Linseed, exempted from payment of the Two Thirds Subsidy of Tonnage and Poundage, 96. King of Spain's Plenipotentiary at. See Cienfuegos, A.
letters dated at, 142, 296.
money shipped to Barcelona at, 20, 21, 32, 92, 93, 205, 217, 246, 2834, 2956, 311, 331, 438.
packet from, charges of, 409.
prisoners of war at, 158. Prizes Agent at. See Tirrell, E.
remittances to, 92, 93, 217, 404, 438. Rights and Perquisites of the Admiralty at, Agent for. See Terrell, E.
squadrons at, 93, 205, 217, 246, 284, 311. Hearthmoney and Excise arrears in, remitted, 366. Liskeard Park, co. Cornwall, disparked, lease of, 128. Lisle, Mary de, petition of, 375. Littleton, Sir Thomas, Treasurer of the Navy. See Navy. loans by, 111, 396, 401, 448. -, Thomas, gift from the Queen at the christening of his child, 362.
tidesmen, 79, 88, 138, 412. Livesay, John, Brigadier, memorial of, 466.
foot regiment of, charges on, for arms delivered in Ireland to, 318.
ordered on an expedition, subsistence, 293.
subsistence for, in Spain, 165, 169, 293, 353. Livingston, Mary, pensioner on the Charity Roll of Scotland, 471, 472. -, Robert, Secretary for Indian affairs in the Province of New York, petition for arrears, 352. Livres, exchange equivalence of, 25, 104, 229, 379. Llanstephan, co. Carmarthen, waiter at, 41. Lloyd (Loyd), , payment to, for use of room for selling prizes, 284. -, Ann, daughter of William Pendrell, pension of, 367. -, Henry, Customs boatman at Milford, 251. -, -, merchant, owner of a transport ship, 305. -, John, of London, merchant, petition of, concerning money paid at New York, 63. -, -, payment to, for a bill of exchange, 448. -, -, tidesman and boatman at Fowey, 212. -, Richard, son of Ann, pension for, 367. -, Thomas, Receiver General of assessments for cos. Chester, Denbigh and Flint, 27980. Loads, Philip, waiter and searcher at Brancaster and Heacham, dismissed, 40, 88. Loans, lost orders on, innovated, 126, 133, 372.
registers of. See Exchequer Receipt, Auditor. Lock, . tenant of a building in St. James's, 191. Lockhart, William, captain, Intendant of the Invalids in Scotland, directions to, 163. Loftin, [John], sum recovered from the Earl of Bellomont by, 449. Logan, Nicholas, pensioner on the Charity Roll of Scotland, 471. Logwood, duty on. See CustomsDuties. LONDON, 37, 45, 59, 78, 91.
brewers of, allowances to, for waste, 205, 324. Chamberlain of. See Fazakerley, Sir W.
Corporation, annuity granted to, for support of Christ's Hospital, 54.
wines for, payment of bill of impost on, 140.
surveyor of. See Barkham, E.
Lord Mayor and Court of Aldermen, informed as to law concerning exportation of gold, 440.
merchants of, 45, 48, 63, 75, 142, 192, 193, 196, 201, 380, 392, 402, 422, 425, 442, 458.
old clothes, etc., buyers of, petition of, 45. 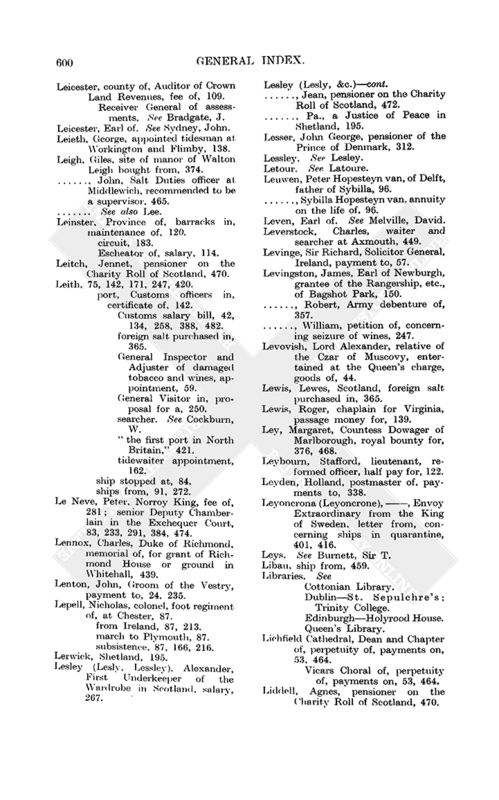 Admiralty Rights and Perquisites in, Agent for, 285. Customs, clerk of the coast business, 331. Comptroller of Petty Customs, 440. Inspectors of the River, watermen to, 467.
deputy, 173, 190, 227, 412.
salary bill, 134, 255, 392. Surveyor of Petty Customs, etc., 292.
tidesmen, 40, 41, 79, 88, 138, 170, 212, 243, 251, 331, 332, 391, 392, 412, 449.
tidesurveyors, 40, 93, 170, 412.
watchmen, 75, 162, 331, 392. Remembrancer of. See Johnson, J. Broad Street, Navy Office in, 377. Cotton House, purchase of, 275, 463. Drury Lane, theatre in, payment for a box in, 420. Fleet Prison, incumbrances on, discovery and settling of, 69. Warden of, prosecuted re accounting for profits, 45. Haymarket, theatre in, payment for a box in, 420. Hyde Park, deer in, hay and beans for, 131.
lodges and barns in, repair of, 23. Ranger or Keeper of. See Portman, H.
Mall, The. See London and Westminster, Streets, etc.St. James's Park. Newgate Prison, prisoners in, 296, 347, 465. Pall Mall, High Street called the, 191, 192, 210. Round Rundles, St. Martin's-in-the-Fields, ground called, 62, 305. St. Botolph's (Buttolph's), poor of, perpetuity for, 181. St. James's and St. James's Palace, 16, 191, 192, 305, 468. Blue Room at, furniture for, 231.
chief residence of the Queen, 348. Council Room, new, mourning for, 231. Duke of Marlborough's lodgings at, 90, 420. Fryery, ground, etc., called, lease of, 172, 183, 1912. Great Drawing Room, new, mourning for, 231. Guard Chamber at, allowance for care of, 223, 299. Housekeeper's lodgings, repairs to, 172.
mourning for the Prince of Denmark at, 230, 231. Music Room, furniture for, 485. Prince's Chapel at, mourning for, 231. Privy Chamber, mourning for, 231. Queen's bed, curtains and screen for, 231. Receiver General of assessments for the Palace and Verge. See Taylor, James. Royal garden at, 191. buildings erected in, 172, 183, 192, 206, 210, 277.
leases of parts of, 172, 183, 192, 206, 210, 277, 316, 347. Royal warrants, Orders in Council, etc., dated at, 49, 57, 62, 68, 77, 81, 834, 89, 90, 98, 108, 132, 150, 154, 161, 163, 165, 172, 176, 179, 181, 183, 188, 189, 191, 2025, 2089, 213, 220, 225, 234, 237, 262, 412, 413, 416, 421, 4245, 4278, 4346, 445, 448, 452, 45962, 4745, 478, 480, 482, 485, 492. Stableyard at, Keeper of. See Thornley, S.
lease of, 206, 210, 277, 347. 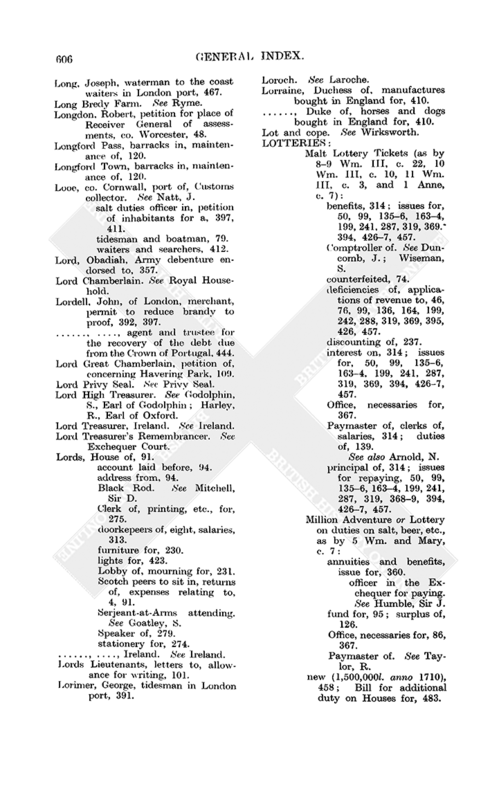 St. James's Park, deer in, hay for, allowance for, 40, 129, 249.
feed of, allowance for, 40, 129, 249.
house and ground in, lease of, 1912. Keeper of. See Berkeley, John, Viscount FitzHardinge. 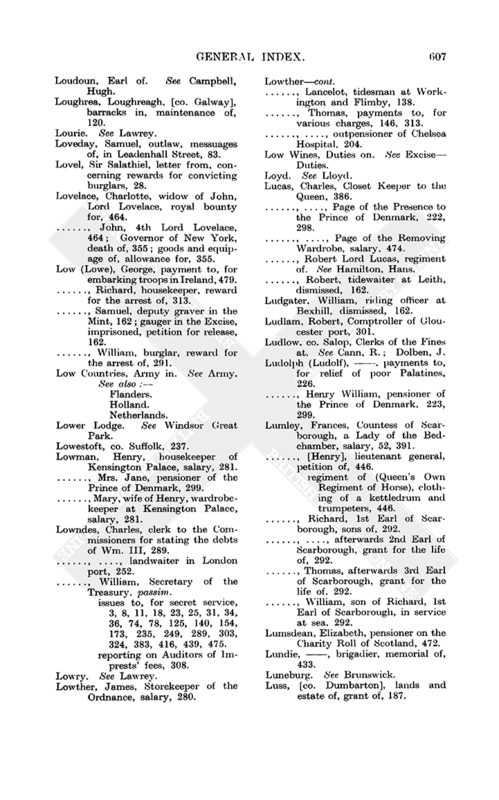 officers (keepers, underkeepers), allowances, 40, 129, 249, 386.
part taken into the Royal Garden, 192. St. John Baptist, Walbrook, poor of, perpetuity for, 181. St. Magnus, poor of, perpetuity for, 181.
leases of land, etc., in, 62, 192, 305. St. Michael's, Cornhill, churchwardens, payment to, on perpetuity for the poor, 101. St. Paul's Cathedral, Queen's statue and pedestal at, marble for, 139. St. Peter's, Westminster. See (below) Westminster Abbey. rent resolute or corody granted by Henry VIII out of, 101. Savoy, French ministers in, [annuity of], payment on, 245.
guardhouses at, repairs to, 161.
messuage, etc., belonging to, lease of, 90. Marshalsea, deserters in, expense for, 446. Swallowfield, St. Martin's-in-the-Fields, ground called, 62, 305. Temple, Master of. See Sherlock, T.
Csar's Chapel, records in. See Records. Constable of. See Capel, Algernon, Earl of Essex. deer waggons, etc., stored in, 199.
prisoners in, diet and lodgings, 50, 212, 423. Vicar of, perpetuity of, payment on, 464. Treasury Chambers, 1, 27, 28. Union Coffee House by the Exchange, 16. 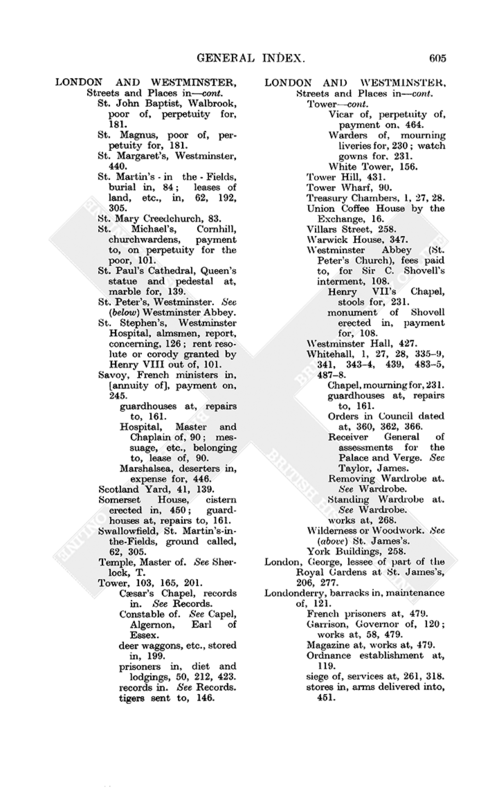 Westminster Abbey (St. Peter's Church), fees paid to, for Sir C. Shovell's interment, 108. Henry VII's Chapel, stools for, 231.
monument of Shovell erected in, payment for, 108. Whitehall, 1, 27, 28, 3359, 341, 3434, 439, 4835, 4878. Orders in Council dated at, 360, 362, 366. Removing Wardrobe at. See Wardrobe. Wilderness or Woodwork. See (above) St. James's. London, George, lessee of part of the Royal Gardens at St. James's, 206, 277. Londonderry, barracks in, maintenance of, 121. Magazine at, works at, 479.
siege of, services at, 261, 318.
stores in, arms delivered into, 451. Long, Joseph, waterman to the coast waiters in London port, 467. Long Bredy Farm. See Ryme. Longdon, Robert, petition for place of Receiver General of assessments, co. Worcester, 48. Longford Pass, barracks in, maintenance of, 120. Longford Town, barracks in, maintenance of, 120. Looe, co. Cornwall, port of, Customs collector. See Natt, J.
salt duties officer in, petition of inhabitants for a, 397, 411. Lord, Obadiah, Army debenture endorsed to, 357. Lord Chamberlain. See Royal Household. Lordell, John, of London, merchant, permit to reduce brandy to proof, 392, 397. -, -, agent and trustee for the recovery of the debt due from the Crown of Portugal, 444. Lord Great Chamberlain, petition of, concerning Havering Park, 109. Lord Privy Seal. See Privy Seal. Harley, R., Earl of Oxford. Lord Treasurer, Ireland. See Ireland. Lord Treasurer's Remembrancer. See Exchequer Court. Black Rod. See Mitchell, Sir D.
Clerk of, printing, etc., for, 275.
doorkepeers of, eight, salaries, 313. Lobby of, mourning for, 231. Scotch peers to sit in, returns of, expenses relating to, 4, 91. Serjeant-at-Arms attending. See Goatley, S.
-, -, Ireland. See Ireland. Lords Lieutenants, letters to, allowance for writing, 101. Lorimer, George, tidesman in London port, 391. Lorraine, Duchess of, manufactures bought in England for, 410. -, Duke of, horses and dogs bought in England for, 410. Lot and cope. See Wirksworth. issues for, 50, 99, 1356, 1634, 199, 241, 287, 319, 369, 394, 4267, 457.
deficiencies of, applications of revenue to, 46, 76, 99, 136, 164, 199, 242, 288, 319, 369, 395, 426, 457.
issues for repaying, 50, 99, 1356, 1634, 199, 241, 287, 319, 3689, 394, 4267, 457.
annuities and benefits, issue for, 360.
officer in the Exchequer for paying. See Humble, Sir J. Office, necessaries for, 86, 367. Paymaster of. See Taylor, R.
Bill for additional duty on Houses for, 483. Loudoun, Earl of. See Campbell, Hugh. Loughrea, Loughreagh, [co. Galway], barracks in, maintenance of, 120. Loveday, Samuel, outlaw, messuages of, in Leadenhall Street, 83. Lovel, Sir Salathiel, letter from, concerning rewards for convicting burglars, 28. Lovelace, Charlotte, widow of John, Lord Lovelace, royal bounty for, 464.
goods and equipage of, allowance for, 355. Low (Lowe), George, payment to, for embarking troops in Ireland, 479. -, Richard, housekeeper, reward for the arrest of, 313.
gauger in the Excise, imprisoned, petition for release, 162. -, William, burglar, reward for the arrest of, 291. Lower Lodge. See Windsor Great Park. Lowman, Henry, housekeeper of Kensington Palace, salary, 281. -, Mrs. Jane, pensioner of the Prince of Denmark, 299. -, Mary, wife of Henry, wardrobe-keeper at Kensington Palace, salary, 281. Lowndes, Charles, clerk to the Commissioners for stating the debts of Wm. III, 289. -, -, landwaiter in London port, 252. -, William, Secretary of the Treasury, passim. issues to, for secret service, 3, 8, 11, 18, 23, 25, 31, 34, 36, 74, 78, 125, 140, 154, 173, 235, 249, 289, 303, 324, 383, 416, 439, 475.
reporting on Auditors of Imprests' fees, 308. 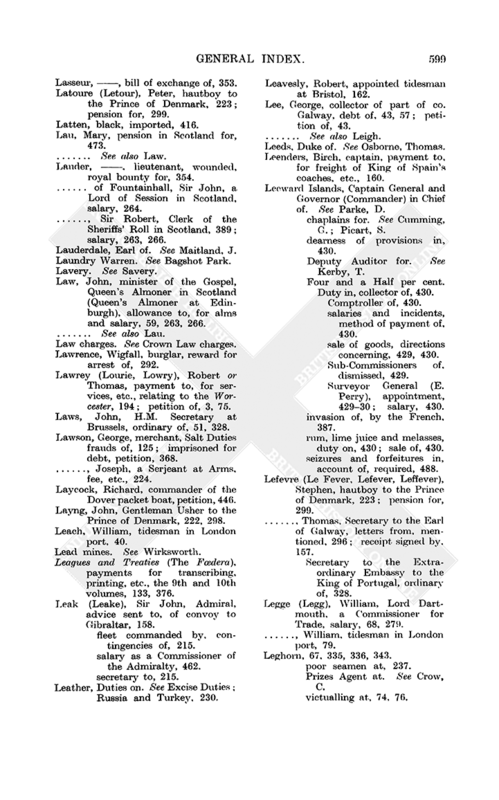 Lowther, James, Storekeeper of the Ordnance, salary, 280. -, Lancelot, tidesman at Workington and Flimby, 138. -, Thomas, payments to, for various charges, 146, 313. -, -, outpensioner of Chelsea Hospital, 204. Low Wines, Duties on. See ExciseDuties. Lucas, Charles, Closet Keeper to the Queen, 386. -, -, Page of the Presence to the Prince of Denmark, 222, 298. -, -, Page of the Removing Wardrobe, salary, 474. -, Robert Lord Lucas, regiment of. See Hamilton, Hans. -, Robert, tidewaiter at Leith, dismissed, 162. Ludgater, William, riding officer at Bexhill, dismissed, 162. Ludlam, Robert, Comptroller of Gloucester port, 301. Ludolph (Ludolf), , payments to, for relief of poor Palatines, 226. -, Henry William, pensioner of the Prince of Denmark, 223, 299. Lumley, Frances, Countess of Scarborough, a Lady of the Bedchamber, salary, 52, 391. -, [Henry], lieutenant general, petition of, 446.
regiment of (Queen's Own Regiment of Horse), clothing of a kettledrum and trumpeters, 446. -, Richard, 1st Earl of Scarborough, sons of, 292. -, -, afterwards 2nd Earl of Scarborough, grant for the life of, 292. -, Thomas, afterwards 3rd Earl of Scarborough, grant for the life of, 292. -, William, son of Richard, 1st Earl of Scarborough, in service at sea, 292. Lumsdean, Elizabeth, pensioner on the Charity Roll of Scotland, 472. Lundie, , brigadier, memorial of, 433. Luss, [co. Dumbarton], lands and estate of, grant of, 187. Lutzau, Katherine, pensioner of the Prince of Denmark, 312. Lyard, , captain in second to Major General Carpenter's regiment of dragoons, 324. Lydall, William, appointed tidesman in London port, 212. Lydd, co. Kent, riding officers at, 162.
petition concerning repair of, 156. Mayor, Corporation, etc., 82, 203.
waiters and searchers in, 449. Lynch, William, Receiver General of assessments for Suffolk, 48, 257. Lyndon, George, captain, petition for a pension in Ireland, 451. Lynn Regis, co. Norfolk, lands in, extended for debt, 83.
port of, boatmen in, 162, 212, 412.
waiters and searchers in, 40, 88. Lynstead, William, Customs collector at Lynn, arrears of, 443. Lyon King at Arms. See Erskine, Sir Alexander.